1.Why do you want to go to the UK?/What is your purpose to the UK?/ Are you going to study in UK? 2.Which university do you plan to attend? 3.When are you going to enter UK? 5.What is your name? date of birth? 2.When will you finish your undergraduate program? 4.Are you a top student in your school? What’s your ranking? 5.What is your TOEFL or IELTS score? 1.What will you study in the UK?/Which degree will you pursue in the UK? 2.In what aspect of your major will you study? What is the difference between your major now and the major in UK? 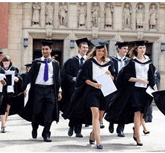 5.Do you know which university in UK is the best in your major? What else? 6.Do you have any research experience? 7.How many universities have you applied? How many of them accepted you?Why you choose this university? 8.Start date and finish date of this program and contents of this program? 11.Do you have any friends in the UK? Do you attend pre sessional course in this university? How many hours in a week? Requirements to continue master programs after finishing presessional course? 14.Where will you live in UK? 1. what is the job of your parents, annual salary?Is there any connection between your major and your parents` job? 2. Do you plan to continue the study in UK? What is your career object?Do you want to work in UK?